1 to 2 Tbs. sugarDirections:Position a rack in the lower third of an oven and preheat to 325°F. Coat a 5-by-9-by-4-inch loaf pan with vegetable oil spray. Dust the pan with flour, then tap out any excess. To make the cake, in a bowl, sift together the flour, baking powder and salt. Set aside. In the bowl of an electric mixer fitted with the flat beater, beat the butter on medium speed until pale and fluffy. Add the sugar and beat well. Add the eggs one at a time, beating well after each addition. Add the coconut and vanilla extracts. Beat in half the flour mixture, then half the milk, and repeat to add the remaining flour and milk. Reserve 1 Tbs. of the shredded coconut for garnish and stir in the remainder. Scrape the batter into the prepared pan. Bake until the top is golden and the center is firm to the touch, 55 to 60 minutes. Transfer the pan to a wire rack and let cool for 20 to 30 minutes. Invert the pan onto the rack and lift off the pan. In a large bowl, sprinkle the mango cubes with the lime juice and sugar to taste and toss to distribute evenly. Place a slice of warm or room-temperature coconut cake on each dessert plate. 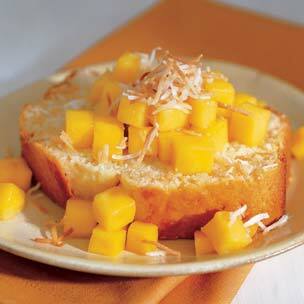 Spoon the mango mixture over each slice of cake and garnish with the reserved coconut. Serve immediately. Serves 8. Adapted from Williams-Sonoma Collection Series, Fruit Dessert, by Carolyn Beth Weil (Simon & Schuster, 2004).